Conservative Voice Radio airs today at 8:00 am Pacific on KMET 1490-AM one last time in that slot as its own separate program. We didn’t even get together to record this one last week. This episode you will hear is what we call the “Tytler” episode, an evergreen show to use when we can’t get together for recording the program. Almost four years ago the Banning-Beaumont-Cherry Valley Tea Party decided they wanted to have their own radio program. We built our own studio, and have come to the listeners on KMET 1490-AM every Saturday Morning at 8:00 am ever since then. During this most recent contract period my program, Constitution Radio, lost an advertiser. Constitution Quest Game has been with me as a sponsor since August 6, 2011. Due to no other reason than that it was time for them to move on, Today’s program at 1:00 pm will be their last hurrah with my broadcast. A couple donors have also moved out of State, leaving Constitution Radio’s second hour in jeopardy of not being funded. The Banning-Beaumont-Cherry Valley Tea Party decided to view the situation as an opportunity. The Tea Party has decided to become the sponsor of my second hour, moving their morning program into that slot. So, next week, beginning on December 22, 2018, the second hour of Constitution Radio will have on the air Glenn and Jan from the Banning-Beaumont-Cherry Valley Tea Party, live. 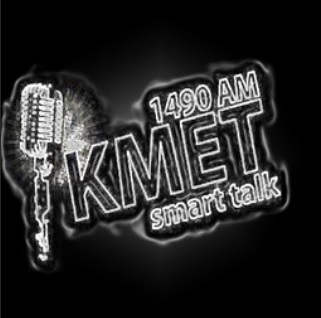 Enjoy today’s programming, and enjoy the Christmas Season as we make our adjustments on KMET 1490-AM. As Europe Burns, and Caravans slam against the southern border, Trump is under attack as usual. Conservative Voice Radio makes sense of it all. Tune in to KMET 1490-AM at 8:00 am, Saturday, December 8 for the Tea Party take on it all. The show is sponsored by the Banning-Beaumont-Cherry Valley Tea Party, and the hosts are all Tea Party Patriots. Post election review Thursday Nov. 8th – 5 PM at the Farms’ House Restaurant, 6261 Joshua Palmer Dr., Banning. Join us to give your prospective and ask questions of our guest speaker and constitutional expert Douglas V. Gibbs about the November 6th election results. Thanks to President Trump, the blue wave was held in check. Conservatives campaigning in California caused billionaire Leftists to spend millions of dollars to defend and hold their position. 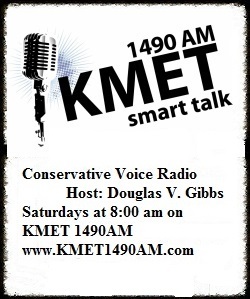 Conservative Voice Radio is on Saturdays at 8:00 AM on KMET 1490-AM, hosted by Douglas V. Gibbs, and co-hosted by Glenn, Diane and Jan of the Banning-Beaumont-Cherry Valley Tea Party. If you missed the program, listen to the archived version on our podcast page. Are the Democrats Devil Worshipers? University cancels West Side Story production after white students land lead roles.